Pomegranates are considered to be one of the oldest known edible fruits. In Greek mythology, the pomegranate represented life, regeneration and marriage, and were considered a favourite food of the gods. Pomegranates are now grown around the world and the main growers are Iran, India, and the U.S.
Pomegranates have a very high antioxidant content, which is beneficial for the immune system. They also provide potassium, which aids the body in metabolizing sugar to glycogen to provide energy. 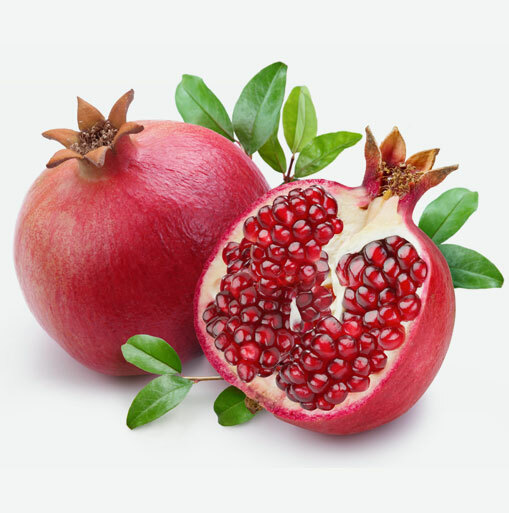 Pomegranates also provide the body with niacin (also known as Vitamin B3) which helps the body to convert protein, fat and carbohydrates into energy and promotes healthy skin and nerves. Pomegranates do not continue to ripen once they are picked, so they will not continue to develop sugar. Choose pomegranates that are plump, shiny and heavy for their size. Fresh whole pomegranates can be stored for up to two weeks in a cool, dry area or in your refrigerator. Be careful before you eat or prepare pomegranates: pomegranate juice stains readily! Pomegranates can be eaten fresh, used in sauces, baked into delicious desserts, and the seeds can even be used as a garnish. The easiest method to get to the seeds is to slice the pomegranate almost in half, from crown to halfway to the bottom. Use your fingers to break the two halves apart, and then tear away the connecting membranes and remove the seeds over a large bowl, half-filled with water. The seeds will sink to the bottom and the membrane will float on the top. Skim off the membrane and strain the seeds in a mesh colander. The seeds and surrounding pulp can also be eaten directly, or placed in a bowl and scooped up with a spoon. Juicing is another way to enjoy the colour and health benefits of pomegranates: to juice them, put the seeds in a blender and pulse a few times, just enough to break up all the seeds. Let the mixture sit for a minute while the hard seed bits settle, then pour through a strainer. Add sugar to taste.